MAN-YI has exited Japan and transformed into an extratropical cyclone. 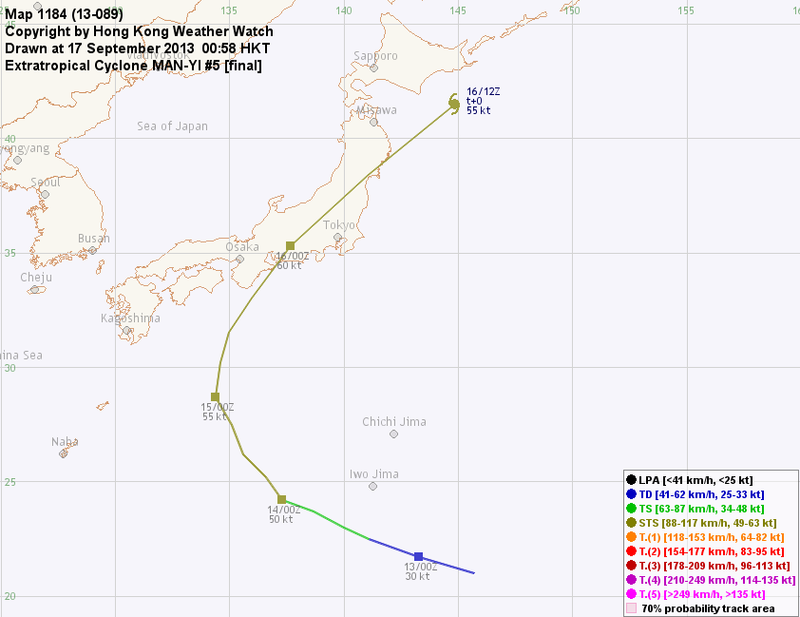 At 8 pm, MAN-YI was centred about 340 km (180 NM) ESE of Sapporo. MAN-YI is the 32nd name in the tropical cyclone name list. It was contributed by Hong Kong, and is now the name of a reservoir. This name was used in 2001 and 2007. MAN-YI is expected to move NE along the NW periphery of the subtropical ridge. MAN-YI has transformed into an extratropical cyclone. This is the final bulletin on MAN-YI. 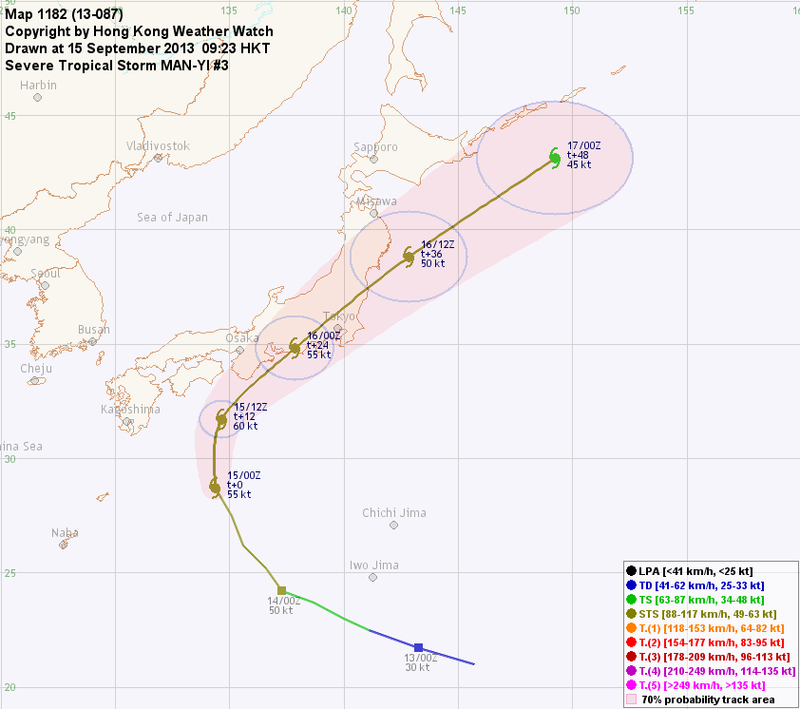 MAN-YI has just made landfall in southern Aichi Prefecture. 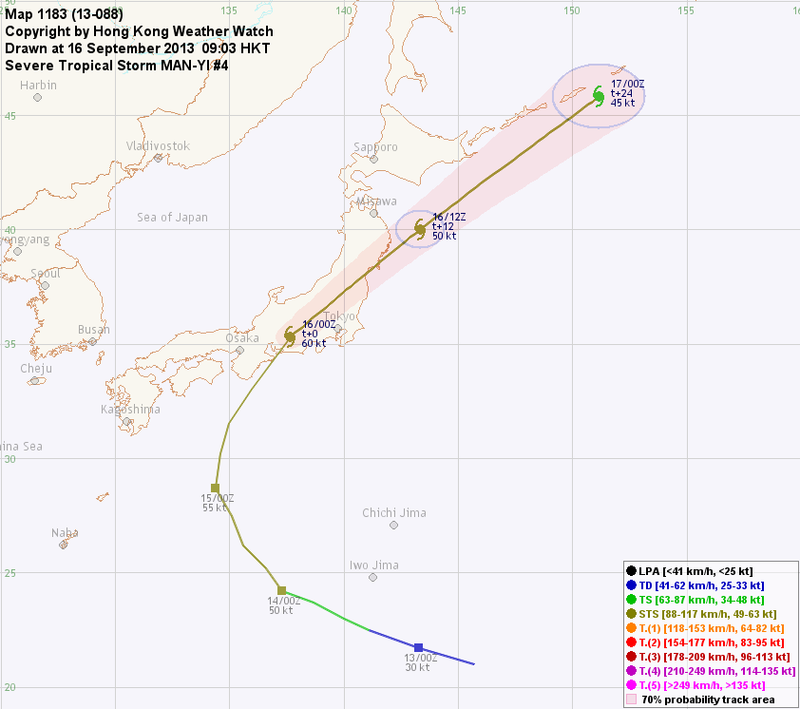 At 8 am, MAN-YI was centred about 190 km (100 NM) WSW of Tokyo. MAN-YI is expected to accelerate towards the NE along the NW periphery of the subtropical ridge. 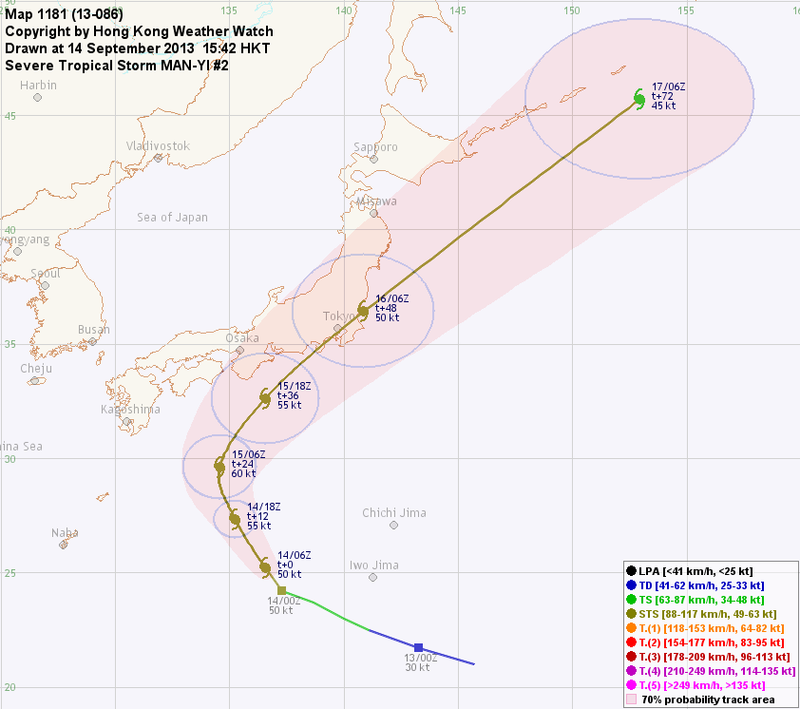 MAN-YI will weaken as it crosses Japan. Extratropical transition will start soon and should be complete by t+24. MAN-YI has intensified slightly over the past 12 hours. At 8 am, MAN-YI was centred about 680 km (360 NM) S of Osaka. MAN-YI will recurve along the weakness in the subtropical ridge, turning to NE later tonight. Track speed is expected to increase. MAN-YI's structure is becoming symmetrical. Slight intensification is possible in the next 12 hours, but as the storm nears Japan it will start to weaken. Extratropical transition is expected by t+48. MAN-YI has intensified into a severe tropical storm and turned northwest. At 2 pm, MAN-YI was centred about 480 km (260 NM) W of Iwo Jima. The subtropical ridge has weakened appreciably and should allow MAN-YI to recurve near t+24. It will accelerate at later taus as it enters the westerlies. MAN-YI is expected to intensify in warm seas with enhanced outflow from the arriving trough. As the storm nears Japan, it will weaken and will transform into an extratropical cyclone by t+72. A tropical disturbance intensified into tropical depression 16W today, and was named MAN-YI. It later developed into a tropical storm. At 2 pm, MAN-YI was centred about 250 km (140 NM) S of Iwo Jima. The subtropical ridge north of MAN-YI is currently guiding it towards the west. 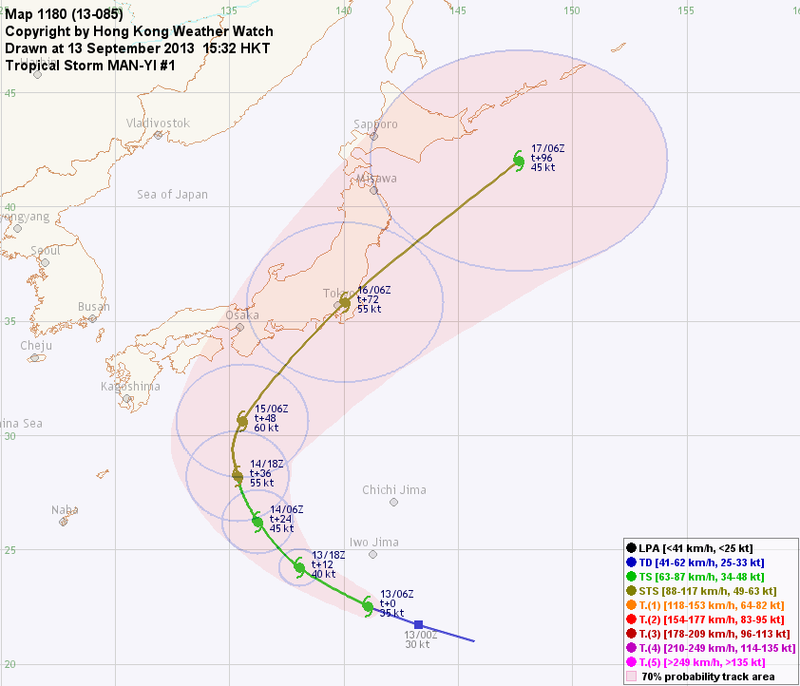 There is considerable uncertainty on the location of MAN-YI's centre as the storm remains unstable in shape. A mid-latitude trough is expected to dig into the ridge and allow the storm to recurve between t+48 and t+72. MAN-YI is expected to intensify gradually in warm seas with enhanced outflow from the arriving trough. As the storm nears Japan, it will weaken and will transform into an extratropical cyclone by t+96.